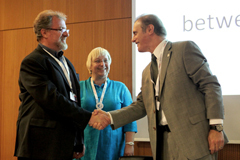 The Memorandum of Understanding laying down cooperation between the RECETOX and CETESB to support the implementation of the Stockholm Convention in Europe and Latin America and Caribbean countries was signed at the closure of the Regional Fair "Synergies through Regional Delivery" in Geneva on Friday, 3 May 2013. The Regional Fair was organized as a platform to enhance cooperation between regional centres of both Stockholm and Basel Conventions in the margins of the joint meetings of the conferences of the parties to the Basel, Rotterdam and Stockholm conventions held in Geneva 28 April – 10 May 2013. Director of RECETOX, Prof. Ivan Holoubek and Regional Centre Director Ms. Kateřina Šebková signed the MoU on behalf of RECETOX, the CEO of the CETESB, Mr. Otavio Okano and his vice-president Mr. Nelson Roberto Bugalho signed the document on behalf of the CETESB. The centres will cooperate in particular on data collection and management for the purpose of the Global Monitoring Plan for the Stockholm Convention and on capacity building, training and educational activities. RECETOX experts have already provided support in capacity building activities in CETESB for the ambient air monitoring in the LAC region in 2012 and March 2013. Additional cooperation and training of CETESB staff in RECETOX is underway for mid 2013. The Research Centre for Toxic Compounds in the Environment (RECETOX), Czech Republic is the Stockholm Convention Regional Centre for Capacity Building and the Transfer of Technology the Central and Eastern European Region. The Regional Centre is a part of the RECETOX, which is an independent Research Centre for Toxic Compounds in the Environment operating within the Faculty of Science, Masaryk University, Brno, Czech Republic. The RECETOX Centre provides long-term support in chemicals management to 23 countries of Central and Eastern Europe and serves as a strategic scientific partner for over 30 countries in Africa and Asia. CETESB serves as the Regional Centre of Stockholm Convention on POPs for Latin America and the Caribbean Region. Among it regional activities, CETESB has led a project on management of contaminated sites with POPs for GRULAC countries: Brazil, Chile, Costa Rica, Dominican Republic, Guatemala, Nicaragua, Panama, Paraguay, Peru, Uruguay and Venezula, and hosted capacity building workshops on new POPs and the updating of National Implementation Plans and reporting requirments for Latin America.